September 2018 – NINDS awards SBIR Phase 1 Grant entitled “Mimicking synuclein toxicity in plant cells to identify novel neuroprotective leads". The background of this SBIR Phase 1 is that several human neurodegenerative diseases, including familial Parkinson's disease, share a mechanism in which the enzymatic modification and subsequent aggregation of a nerve cell protein called alpha-synuclein kills nerve cells. Plant root cells contain a similar enzyme, but they do not contain alpha-synuclein. By creating plant cells expressing human alpha-synuclein the applicants will be able to seek novel plant metabolites that inhibit this neurotoxic process and that will lead to novel drugs to treat these devastating neurodegenerative diseases. August 2017 – NIAAA awards SBIR Phase 1 Cooperative Agreement Grant entitled “Development of JR-220 (4-Chlorobenzylidenamino-guanidine hydrochloride) as a medication for alcohol dependence". The background of this SBIR Phase 1 is that dependence on alcohol is a very serious problem in the US with a huge medical and financial burden. Current treatments are unsatisfactory and new medications are required. Naprogenix is developing a new drug, synthesized at the University of Kentucky that has shown great promise in preclinical development, and this proposal is to obtain the data necessary before investigation of the drug in the human. March 2017 – NCCIH awards SBIR Phase 2 Grant entitled “Harvesting specific plant metabolites from hairy root cultures using magnetized nanoparticles". The background of this SBIR Phase 2 is that drugs can be produced in plant cell cultures as an alternative to extracting them from intact plants. This has some advantages, but a major disadvantage is that "harvesting" the drugs requires the destruction of the slow growing and expensive plant cell cultures. This phase II proposal is to further develop a continuous harvesting system in which nanoparticles can be used to extract drugs from plant cells without damaging the cells. September 2016 – NIAAA awards SBIR Direct Phase 2 Grant entitled “Mutant transgenic plant cells as a novel source of drugs". Background: Naprogenix is developing a technology which enables us to "tell" mutant cells of a plant species what kind of drug we want them to make. This proposal applies the technology to drugs that may be of value in Parkinson's Disease or drug dependence. The main objective is to show that the technology works, so that it can be adopted by the industry as an alternative to chemical synthesis as a source of new drugs. The objective is further development of a biotechnology that "evolves" biosynthesis in a plant species toward bioactive metabolites with a specific molecular target. September 2014 – Naprogenix has been awarded from NIAAA SBIR Phase 1 Grant entitled “Novel flavonoids as anti-inflammatory agents in alcoholism”. Background: Alcoholism (either dependence or abuse) affects more than 8% of the population of the US, and the societal costs approach $200BN annually. About half of this sum is medical cost, much of which is accrued in treating alcohol-related organ damage. This organ damage is commonly associated with cellular inflammation, and this is also a major contributing factor to alcohol-induced neurodegeneration, which may rival Alzheimer's dementia in its prevalence in the US. Despite this, there are currently no accepted approaches to preventing or reversing this tissue damage. This project proposes a novel approach to organ and brain damage which has major implications for pharmacotherapy of, and/or nutritional intervention in, these therapeutic targets. May 2014 – NCCAM awards Naprogenix a STTR Phase 1 Grant entitled “Harvesting specific plant metabolites from hairy root cultures using magnetized nanoparticles”. 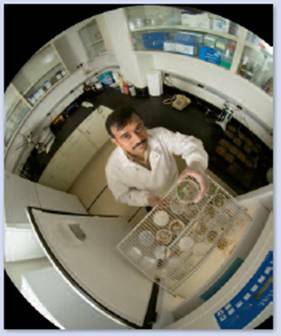 The overview of phase I of the STTR Grant is that many valuable plant compounds can be produced in tissue culture, but their isolation requires destruction of the plant tissue before chemically separating the required compounds from others. This project aims to develop magnetized nanoparticle devices that can be used to remove specific types of compounds from living plant tissue. This is predicted to greatly increase the efficiency of producing medicines or nutrients in plant tissue culture. These devices will also increase the commercial value of the proprietary biotechnology used by the applicant company, which is designed to optimize plant cell cultures for their ability to produce specific natural products. September 2013 – Naprogenix has been awarded from NIAAA SBIR Phase 2 Grant entitled “Selection-driven plant metabolites for treatment of CNS diseases”. Project Background: Plants are a major source of existing medicines, but the pharmaceutical industry has now almost abandoned this source in favor of synthetic chemicals. One reason is that plant metabolites are often too complex for synthetic methods to be used for their modification or production. The technology being developed by Naprogenix uses the plants own biosynthetic capacity to modify the active chemicals contained in the plant. It is also capable of increasing the amounts of the active chemicals that are present. The “directed evolution” of a plant species using this technology is capable of generating novel compounds that may be of value in many CNS diseases, for example the targets in this project are important in drug dependence and neurodegenerative disease. July 2013 – Naprogenix has received a KY Matching Funds Award entitled “Accelerated implementation of Commercialization Plan for Novel Pharmacotherapies for Alcoholism”. This proposal is to extend the research to improve the potential value of the products in alcoholism. March 2013 – NIAAA awards Naprogenix a SBIR Phase 2 Contract entitled “Novel Pharmacotherapies for Alcoholism”. The objective of phase II of the SBIR Contract is to evaluate four lead compounds as treatments for alcoholism. January 2013 – Terry Minton becomes the full-time CEO of Solidagex and Dr. John Littleton assumes the role as CEO of Naprogenix. September 2012 - NIAAA awards Naprogenix a SBIR Phase 1 Contract entitled “Novel Pharmacotherapies for Alcoholism”. The project aims to discover new drug or nutritional approaches to the treatment of alcoholism. This condition is common and devastating, with relatively ineffective current treatment. The project therefore has the potential for great therapeutic and commercial application. June 2011 – Naprogenix announces the spin off of Solidagex, a new company to commercialize to promote native goldenrod-based products. Research & Development performed by Naprogenix on its native plant extract library identified a native goldenrod species as containing novel valuable activity in flavonoid-rich extracts from this species. Terry Minton will become the CEO of Solidagex. Solidagex will be raising private capital to begin commercial operation to produce goldenrod extract for incorporation into existing and new products through contracts in pet food, cosmetic, and nutraceutical companies in the market.. Naprogenix intends to follow a similar commercialization plan for other products that are identified in wild type plant extracts in its library. Naprogenix, Inc. is a research and development company focused on identifying valuable bioactivity in native plants to produce extracts or chemical compounds of commercial interest. Solidagex, Inc. produces natural extracts from Kentucky's native goldenrod plant for use as bioactive ingredients in the nutrition, cosmetics and Ag-bio industries. Solidagex offers customers the opportunity to derive multiple benefits from one source of proprietary ingredients. September 2010 - Minton Named Naprogenix CEO - Naprogenix, Inc., a drug discovery and plant biotechnology company based on University of Kentucky and proprietary intellectual property, announced today that it has appointed Terry Minton to be its CEO, effective immediately. Minton, a Louisville resident with a wealth of experience in the healthcare and biotechnology industries, is best known for his having launched the cancer therapeutics company Aptamera with Dr. Donald M. Miller, Director of the James Graham Brown Cancer Center. Amidst the economic disruption wrought by the events of September 11, 2001, Minton raised several million dollars in angel and venture funding and positioned the company for its acquisition by the British pharmaceutical company Antisoma PLC. Minton has held CEO and other leadership positions with various companies in the healthcare technology and biotechnology sector. Additionally, he spearheaded the development of high-value intellectual properties at the Innovation Center for a Kentucky-based Fortune 100 health benefits provider. “Terry Minton is the perfect fit to lead Naprogenix – an experienced biotech CEO who has raised millions in equity capital and formed alliances with global companies capable of taking products created by the Naprogenix technology platform into worldwide distribution,” said John M. Littleton, M.D., PhD., Chief Scientific Officer and Co-Founder of Naprogenix. “Not only does Terry Minton understand this space, he has a consistent track record of delivering in fundraising, product development and intellectual property licensing and other monetization activities,” added Littleton, who had been serving as interim CEO until a nationwide search for a replacement led Naprogenix to Minton. Naprogenix is the recipient of over $6 million in National Institutes of Health (NIH) Small Business Innovation Research (SBIR) and Small Business Technology Transfer Research (STTR) funding, as well as support from the Kentucky Science and Technology Corporation, and is the exclusive licensee of patented technology owned by the University of Kentucky Research Foundation, Inc.
Naprogenix’s technology harnesses the power of plant metabolism by subjecting native and engineered plant extracts to high-throughput pharmacological screening to discover novel, patentable structures and activities useful for the treatment of neurodegenerative diseases, cancer, age-related macular degeneration, and other chronic diseases. Certain of the natural products are also useful as all-natural pesticides. Minton will serve as President/CEO and Chairman of the Board of Directors of Naprogenix and is expected to focus initial efforts on accelerating product development along with consummation of strategic alliances with global healthcare, nutritional and personal care products companies. Naprogenix was one of twenty companies that were recipients of KY SBIR/STTR Matching Funds. In honor of these twenty companies, Kentucky’s Governor Ernie Fletcher and Commissioner for Department of Commercialization and Innovation Deborah Clayton ceremoniously awarded $1.875 million dollar check to all the representatives of the funded companies. Naprogenix received KY matching funds for our National Cancer Institute Phase I STTR on Novel estrogen receptor ligands from plant genomic. Both the Louisville Courier Journal and Lexington Herald Leader newspapers recognized Naprogenix as one of the awardees of this funding from the KY State Government. http://www.expertopin.com/toc/edc/2/5 to obtain copies of Dr. Littleton’s article. 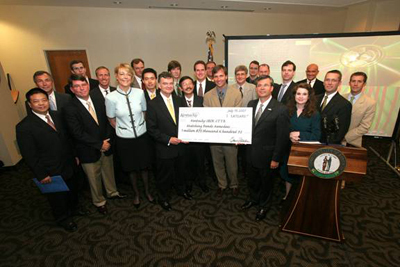 January 2007 – Lexington Venture Club recognizes Naprogenix as one of the regional, early-stage companies that received funding in 2006. 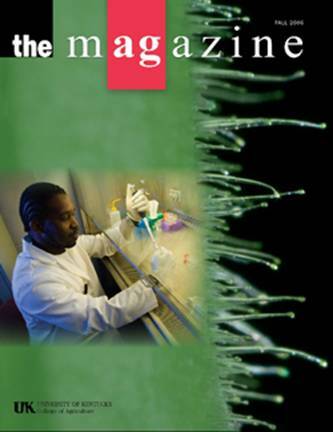 Fall 2006 – Naprogenix was featured in the University of Kentucky College of Agriculture “the Magazine” article titled “Biotechnology – Moving Beyond the Lab”. January 2006 – Dr. Deane Falcone and Dr. John Littleton were awarded United States Patent 6,989,236 titled “Methods to identify plant metabolites”. Spring 2006 – The Lane Report’s Magazine featured Naprogenix in their annual “Research Kentucky”report. 2003 –Naprogenix obtains the exclusive license agreement with the University of Kentucky on patented NPG technology.